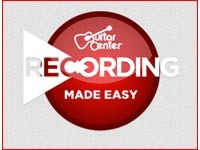 Get Free Music Recording Classes at Guitar Center on every Saturday at 10am. Guitar Center has partnered with Avid and is proud to offer a new Recording Made Easy Pro Tools 10 class. Every month we will present a series of four classes that show you how to take your ideas from basic tracks to finished songs using your Apple computer and Avid's industry standard Pro Tools software. Reserve your seat now, as capacity is limited!